Today, it’s increasingly cool to be “green.” That’s good, but like every great idea, this one is being claimed by the generation that happens to be embracing it. A quick look at the habits of our grandparents (and great-grandparents to anyone under the age of 40), though, shows that we still could learn quite a bit from the way they managed their resources. A great example of vintage green is how they used feedsacks. If the word “feedsack” conjures thoughts of burlap, then you probably weren’t around before 1960. From the mid-1920s through the beginning of the 1960s, products bought in bulk such as flour, sugar, and animal feed were packaged in colorful printed cotton sacks. Sack packaging first appeared in the 19th century, but those sacks were made from white or unbleached muslin. Even so, the sacks were saved and reused, or they were cut and sewn into clothing and household goods. The printed and colored sacks came about as part of a clever marketing scheme. Someone at one of the many sack factories realized that they could sell more bulk products if their sacks were colorfully printed. The idea was that repeat customers would choose printed sacks if they needed extra fabric to match a sack they already had. The plan was successful, and soon printed sacks were commonly used as packaging. Consumers loved them and before long many Americans were using feedsacks to make everything from aprons to underwear. One 100-pound sack was large enough to make a simple blouse, but it took at least three to make a dress. Sack manufacturers even distributed booklets with suggestions for using the material in different ways. Women would trade sacks with neighbors in order to get matching ones, or they would take a favored print with them as they went to the mill or store in the hopes of finding a match. Often the town bakery would sell its extra flour and sugar sacks. Today, many people associate feedsacks with the Depression, and they certainly were used during that time when money and resources were tight. They were also very much in use during World War II, when textiles were rationed. For example, in 1945, my aunt, Ruth Underwood, made her wedding dress from feedsacks. There was no money to buy a dress, and fabrics were still in short supply. The solution was to use what she had on hand. All through the years that they were produced, feedsacks were saved and used. To have not saved them would have seemed extremely wasteful—our society had not yet learned to generate the massive amounts of garbage that we do today. In the late 1950s, many mills turned to less expensive paper sacks, and by the early 1960s, cloth sacks were pretty much a thing of the past. Considering how useful they were, it’s surprising that so many survive intact. That’s a very good thing for crafters and home sewers who want to stop contributing to the waste that’s produced by the manufacture of modern textiles. By using vintage feedsacks and fabrics, one can significantly reduce his or her impact upon the Earth. Just remember, save your scraps for quilters! As always, very interesting and informative. I would love to see a picture of your Aunt Ruth in her feedsack wedding dress or a picture of the dress if either picture exists. Thanks so much! I’m afraid there are no photos of my aunt in her wedding dress. And she wore the dress so much she finally had to use it for rags! This makes me smile. I remember the thrill of selecting the feed/flour sacks I liked so my mother or grandmother could make something for me. Then I got the scraps to make doll clothes. Was good training as I was sewing my own clothes by 4th grade! Wonderful articles on using feed sacks in the 30’s and 40’s. Most of my school clothes at that time were made from flower sacks. The print was just right and my Mother and Grandmother saved the sacks after washing to make my clothes each school year at that time. I had a dress for each day of the week which was back in 1939 when I was in the first grade and yes the scraps was used in their quilts. 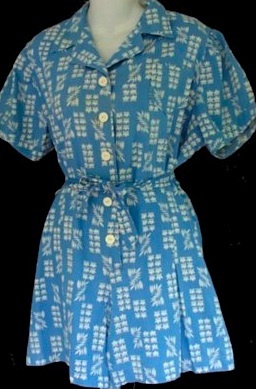 I have a feedsack dress with matching bloomers that my aunt made for me when I was a baby. It was around 1970, so she must have saved the material back. It is bright yellow with red rosebuds– so sweet.